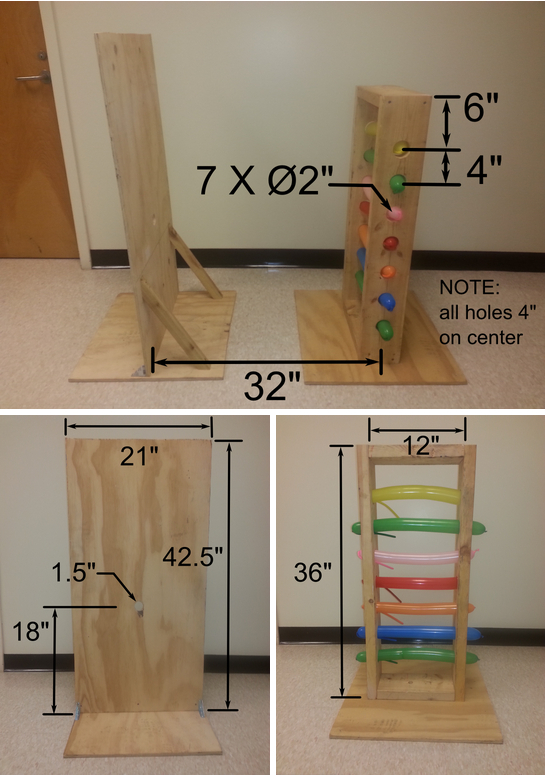 The purpose of the Hole-Sheet-Bang competition is to build a device that is capable of popping as many balloons as possible while keeping costs to a minimum. The device will be placed behind a wooden sheet with a 1.5” diameter hole, which is 32” from the centerline of a wooden frame holding seven (7) balloons. Each team will have three opportunities to break as many balloons as possible. Popped balloons are not replaced. One point is awarded for each broken balloon, to a maximum of seven. A strike, which consists of popping all seven balloons in the first shot, will be awarded a total of ten (10) points. A spare, popping all seven balloons in two shots, will be awarded eight (8) points. The following power sources are not permissible: compressed gas, explosives, or electricity of any form. The device must be self-supporting. No human intervention can be used to hold or stabilize the device. Suction cups may be used to temporarily affix the device to the floor or the wooden sheet; however, no other adhesives or physical connectors (e.g., tape, glue, screws, or bolts) may be used to provide stability. The device must have a mechanical trigger. The device should be able to placed and locked in an “armed” condition. The device may only be triggered by a single student using a single hand. No human energy may be imparted to the device during triggering. ALL valid parts must have a catalogue number on the Staples website <http://www.staples.ca>. Presence of any non-standard parts will result in disqualification. Items need not be purchased from Staples; however, they must have an identical item in the Staples catalogue. You may request a ruling on part equivalence prior to testing to ensure that your group is not disqualified. Items may be disassembled, cut, or otherwise altered before inclusion in the device. Only basic hand tools (e.g., hand saw, screwdriver, hammer, glue gun) may be used to alter items. Costs must be calculated using the list price on the official website <http://www.staples.ca>, regardless of the actual purchase price. Item costs and calculations should be reported to the nearest penny (i.e., two decimal places). Where items are sold in packages of two or more, the item cost may be calculated as a fraction of the total. For example, thumbtacks are sold in packages of in packages of 100 for $1.99. Therefore, the cost of five thumbtacks is (5/100)$1.99=$0.10 after rounding to the nearest penny. Where items are disassembled or cut, the item cost is equivalent to the original part. For example, a pack of 14 retractable ball point pens sells for $5.40. If you took one pen apart to use the spring, the cost of the spring would be (1/14)$5.40=$0.39 after rounding to the nearest penny. If multiple pieces are used from the same source item, the total costs of the pieces should be equivalent to the source price. Each team will be required to submit an itemized price analysis before their device may be tested. Each device must have the team number displayed prominently on the device. Numbers should be a minimum of 1” in height. The device will be photographed and visually compared against the part list included with the price analysis. No additions may be made to the device after this point. Once the evaluation has been completed, each team will have a maximum of five (5) minutes to complete a maximum of three (3) attempts at popping balloons. All repairs, repositioning, arming, shooting, etc., count toward the time used. After five minutes, testing will be halted. The performance score will be based on balloons popped during that period. At the beginning of each attempt, and in its “armed” configuration, every part of the device must be fully behind the surface of the wooden sheet closest to the balloon frame. No attempt will be allowed if this condition is not met. After triggering, some part of the device will of necessity break the plane of the wood sheet nearest to the balloon frame. The popping function of the device must use the 1.5” diameter hole in the wooden sheet. Failure to do so will result in disqualification. The performance score for each group will be calculated after the third attempt, after the expiration of the five minute time limit, or after all balloons are popped. Students will have the opportunity to reset their devices, including retrieving any projectiles. Balloons broken during the resetting process will neither count towards a team’s score, nor will the accidentally broken balloons be replaced. Finally, the safety of all students is of the paramount importance. The instructor reserves the right to prevent any team from competing if it is believed that their device cannot be tested in a manner that ensures student safety.